Having specific needs to compile a program with different compiler options than the rest of the programs in a project; how can you accomplish this task either inside the IDE or from the command line? Home > All Categories > isCOBOL Compiler > Having specific needs to compile a program with different compiler options than the rest of the programs in a project; how can you accomplish this task either inside the IDE or from the command line? Let's say that the program in question, due to its size, needs to be compiled with the -big compiler option. This option may cause a performance issue, which cannot be used by all the programs in a project. Right click the particular source program and select "Properties", go to the B tab and select "-big"
In the Title's bar of the Properties windows, you can see the name of the specific program for example "Properties for SONGS.cbl", then you can set all the properties you need for this specific program. Afterwards save it; every time you compile or execute this program, the IDE will take these properties instead of the project's ones. Something that you should be aware of is that these settings belong to the specific project where they were set. In other words, if you copy or link this program into another project, or if you recreate the workspace of the project or if you share it with other developers via SVN, you will lose these settings, and you will need to manually set them back in the new workspace. You can add the IMP OPTION Directive in the very first line of the source code. 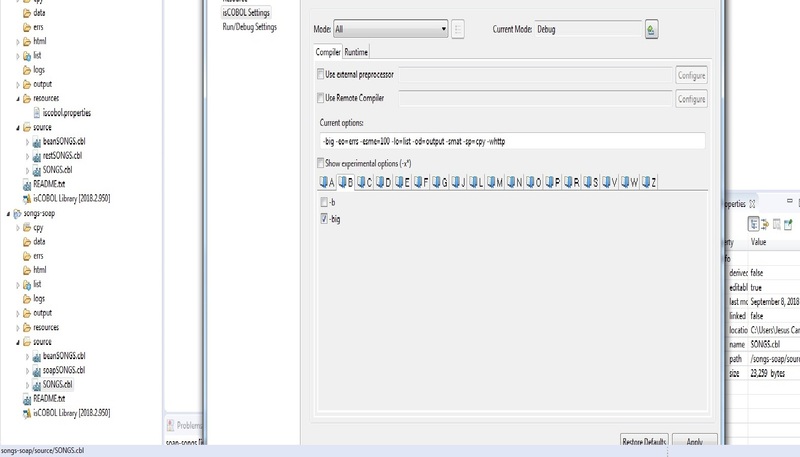 In the above sample, the program eg001 will be always compiled with the -dz option and never will be compiled with the -di option, and this is due to the - or the # symbols preceding the compiler options in the string. You may use the same 2nd approach described above: "Using the IMP Option Directive"
Authored by: Veryant Support This question has been viewed 619 times so far. Click Here to View all the questions in isCOBOL Compiler category. Can you provide an example ant build script (e.g. build.xml)?